Power Armour is without doubt the best defensive ally you've got. It does have it's downsides and players will need to work around these inconveniences. Aside from finding rare Fusion Cores, learning how to repair your armour is one of the most common questions asked by new players. Before we start, let's take a look at the basics. As you venture deeper into the wasteland you'll come across even more fearsome predators who take enjoyment in ripping you to shreds. 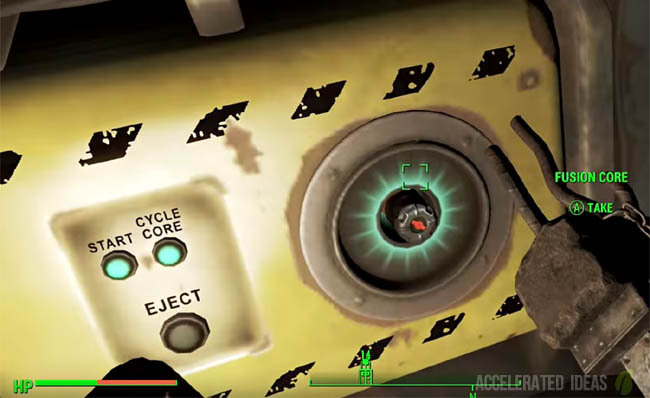 The notorious Deathclaw will happily smash through Power Armour in a matter of seconds, but even light damage over time will stack up. Once your Power Armour reaches a critical stage, it is classed as damaged. It's not usually the entire suit that gets damaged but rather part by part. So for example, you might find that the right leg is damaged first or maybe the left arm. Whatever the case, the Armour part will appear in red rather than yellow to signify that it needs repairing. See the image above which shows the right leg has been damaged. 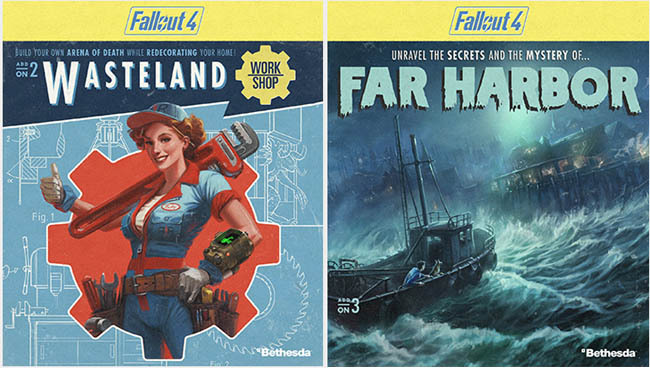 Throughout the Fallout 4 world that are various workstations, some for weapons others for armour, and even some for expanding a settlement. 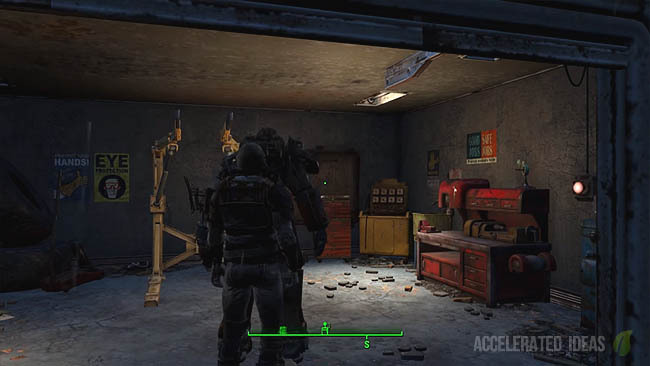 The one you're interested in is the Power Armour Station, shown in the image above. Note the yellow/brown frame on the left of the image, this is the station. These stations allow you to access you inventory, equip different parts, make repairs and even modify existing armour. These are scattered around the world, but there's a list of locations at the end of this post. 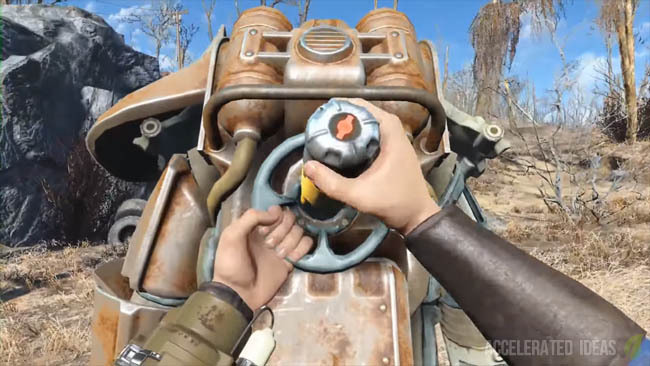 A simple example is Red Rocket Truck Stop, not far Southwest from Sanctuary at the start of the game. Simply step out of your Power Armour and then interact with the station. You'll immediately see a menu option that displays your inventory. Take note of the contextual menu at the bottom of the screen which has options for Equip, Repair and Modify. Scroll through the list and select a part you want to repair. For PC players this is the T key but for console players please check the appropriate button. Note: different parts require different resources in order to be repaired. You should maintain a healthy stock of Steel, Aluminium, Copper and Plastic to ensure that you can repair your Power Armour at any time. Here's a handy list of locations where you'll find a Power Armour Station. It's not a complete list but there's enough there to keep you going in the early game. Red Rocket Truck Stop - Northwest Commonwealth, Southeast of Sanctuary. Hardware Town - The Fens, Boston Neighborhoods (centre of world map, Southwest Boston Neighborhood). Cambridge Police Station - Cambridge Neighborhood, Boston Neighborhoods (centre of world map, Northwest Boston Neighborhood). Wicked Shipping Fleet Lockup - Northwest Commonwealth, South of Sanctuary and just Southeast of Abernathy Farm. O'Neill Family Manufacturing - Far Southwestern side of the map, just North of Sentinel Site and Southwest of Skylanes Flight 1665. Sanctuary - Northwest Commonwealth, just Southeast of Vault 111 (start of the game).